I am always on the lookout for good books for my children, including interesting and inspiring Islamic children’s book. Jannah Jewels caught my eye because of the adventurous looking girls on the over and the idea of a group of young girls going through numerous adventures. 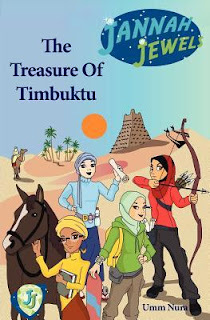 I liked that the book cover shows that the girls are of different races and have different styles – one of the things I love about this ummah is its variety and diversity. Jannah Jewels are four ordinary looking Muslims girls with some extraordinary qualities. Each excels in one of the sunnah sports (horse-riding, archery and swimming, okay so maybe not the one that likes skateboarding), each has a role (leader, artist, encyclopaedia, environmentalist), a superpower, and a special gadget as well as her own fear (spiders is one). Before reviewing I passed the book to my daughter to read, because I felt that it was her opinion that counted. She read the book in one sitting and absolutely raved about it. When asked what she liked, she described some of the more adventurous scenes from the book. Her favourite character was Iman (my favourite too – she is the clever one). I liked that the Jannah Jewels have to say “Bismillah” (I begin in the name of Allah) before they do anything and that when they need help they have to ask Allah (SWT) sincerely. More than this I liked that the characters remember to thank Allah (SWT) when help comes, how many times does Superman remember to do this? The book touches on various issues such as the environment and sustainability, the history of Africa and the richness of Islamic history. I wondered if children would be able to fully appreciate the authors attempt to highlight the fact that history can be subjective, for instance the negative stereotypes around Africa common today in comparison to the rich and sophisticated Africa of the past. As Mansa Musa says to the girls “I have believed in Africa for a long time. I believe in its history and its academic and spiritual power.” Certainly a noble attempt and one I hope made my daughter think. Probably the only criticism I might have with the book is that jumps very quickly from one scenario to another, but this is understandable when you consider how much is crammed into this little book its energetic pace. Overall I am glad I got my hands on the book and I am looking forward to the next edition. I could really feel the love that went into this book – the characters, the places, the history, and the things that the author clearly strongly believes in and wants to share with our children and the wider world through her heroines. I won this book from a blog and my 11 yr old daughter read it. This reminds me I need to blog about it. Thanks for the review sis! Looking in to it now for my girls! Sis C, I look forward to your view. Sis FF - I think your girls would enjoy, I'm waiting for the next instalment to come out.